I’d like to introduce you to a series of guitar publications, Mosaic Editions. It will feature arrangements for guitar ensemble made by Raymond Burley. 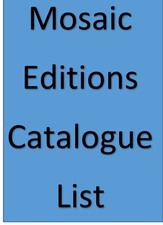 Each edition comprises a full score and parts. The pieces are arranged for standard instruments only. Payment can be made using PayPal. Each edition has its own page where you can see a sample of the music before you purchase and details on how to order.